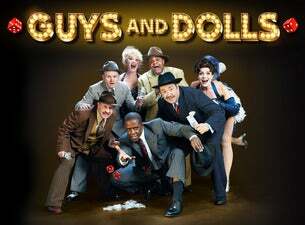 Don't miss Guys and Dolls, the musical fable of Broadway! Join the smooth-talking Sky Masterson and sweet yet sad Miss Adelaide, along with no-good Nathan Detroit and the straight-laced, gambling-opposed Sarah Brown for this feel-good show. This sizzling tale of gamblers, gangsters and nightclub singers (plus a missionary!) features some of Broadway’s greatest tunes – like Sit Down You’re Rockin’ the Boat, My Time of Day and the show-stopping Luck be a Lady. Hailed as the perfect musical comedy, Guys and Dolls swaggers into the Royal Albert Hall this October with the Royal Philharmonic Concert Orchestra and an all-star cast.